And so the recriminations begin. A letter from Oakland City Attorney John Russo gave a Rajon Rondo-on-Brad Miller style slap to Lew Wolff. Zennie Abraham quickly jumped on it, as did Robert Gammon. I’m sure the comments section will be full of people going back and forth yet again on the subject, so I won’t bother rehashing history for the umpteenth time. Abraham somehow managed to bury the lead in his blog post by not acknowledging in text what he said in his vlog – discussions with the A’s and the Blue Ribbon Committee are not going well. That development is anything but surprising, given the committee’s makeup. Matier and Ross reported on yesterday’s meeting between Wolff and Dellums. Fittingly, the meeting was derailed by a planned fire drill, forcing the parties to move the proceedings elsewhere. Russo isn’t going to pen a legal brief on his own, he has orders. He may have done it at the behest of the Mayor or City Council. Abraham speculates that it’s a step towards pitting Oakland and the Giants against the A’s and MLB. He even trots out old Rule 52, which as I’ll explain later, is not applicable these days. What recourse do the Giants have, then? They can try to go to bat for Oakland, even though they have no history of doing that previously. Even though, in moving to China Basin, they’ve actively siphoned East Bay fans away from the A’s. Even though they’ve held a regional hegemony for decades. It wouldn’t be hard to posture themselves as saviors of baseball in Oakland – no matter how strange that sounds – as it wouldn’t require much effort and could be done in a sort of stealth mode. It wouldn’t be difficult to get a few letters from prominent pols in order, so no problem there either. The best part is for the Giants is that it works. It paints Wolff as a villain and Oakland as a victim, despite the backstory’s greater complexity. Problem is, behind all of the sizzle there isn’t much, if any, steak. For Oakland to be successful, there still needs to be an actual ballpark deal in place. The Giants know firsthand what it means to fail to get a stadium built, they’ve understood it many times over. All of this posturing is fantastic if you’re trying to win a war in the media, it’s not good for getting anything done. Could the Giants be brazen enough to goad Oakland into a lawsuit against the A’s and MLB? The A’s and Oakland are only tied together via a lease deal at the Coliseum. As valued as history and tradition are, they are largely intangible. Collusion? R-i-i-i-ght. Does Oakland really want to go down the path of trying to prove that? They’re not the only ones with documents. Would the Giants try to bring Bob Piccinini out of the woodwork to do the same? Ironically, Vincent Piazza sued MLB over the Giants’ aborted move to Tampa-St. Pete, and eventually got $6 million to go away. Unlike Piazza’s almost immediate action, a move to sue now would likely be beyond any statute of limitations. The fact is that suing to keep a team in town, even if you have a good case, isn’t much of a winner. It certainly didn’t work for Seattle. Make no mistake, the Giants aren’t taking the T-rights matter lying down. It isn’t simply a matter of them being quickly and/or cheaply paid off. They want to defend their territory as vigorously as possible, and I don’t blame them. It’s really a matter of whether or not their whining will get more than a token acknowledgment as MLB looks towards further stabilizing the league as a whole. As for Rule 52, even if it were in place (which isn’t verifiable at this point), it isn’t applicable to an A’s move to San Jose. It applies to moves near an established territory, not an invasion of a territory. It would’ve been applicable to an A’s move to Fremont, since either ballpark site was only 5 miles from the Santa Clara County line. Yet, did Peter Magowan raise a big fuss about it? Nope. 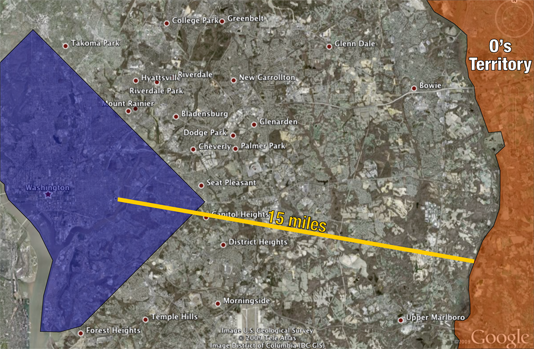 Contrary to popular belief, it would’ve been applicable to the Expos’ move because portions of DC are within the 15-mile O’s territory buffer. Yet while Peter Angelos objected in the end, Rule 52 was nowhere to be found. How bizarre would a lawsuit look? Oakland, backed by the Giants, would allege collusion between the A’s ownership and MLB. The A’s would probably counter that the antitrust exemption is keeping them from moving to San Jose. San Jose/Santa Clara County, not the A’s, would sue MLB and the Giants, thereby threatening the antitrust exemption. I’m sure that Bud Selig’s stockpiled a ton of antacid just in case.